Join us on Feb. 18th and 19th to celebrate the memory of Debii $$ Conant during our Ladies Tournament. 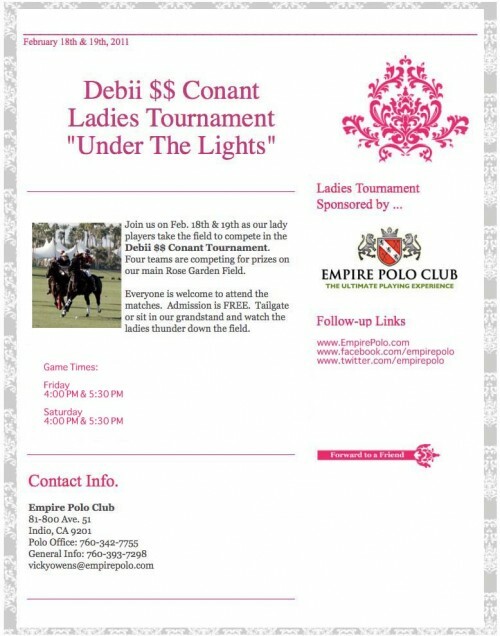 Four teams will take the fields on Friday night to compete for the 2011 Debii $$ Conant Women’s Tournament Title. Please take note of the game times. We are moving our Polo Under The Lights time up for these ladies. The first game is at 4 PM on Friday and the second game is at 5:30 PM. Each game lasts approximately 1 hour. Food and beverage concessions will be available during the games. General Admission is FREE. Come tailgate or sit in our bleachers, grandstand or in a private VIP box. Open seating all night long! Sunday, Jan. 9th, 2011: Opening Day & Hat Day at Empire Polo Club. Games at 12:00 and 2:00 PM. 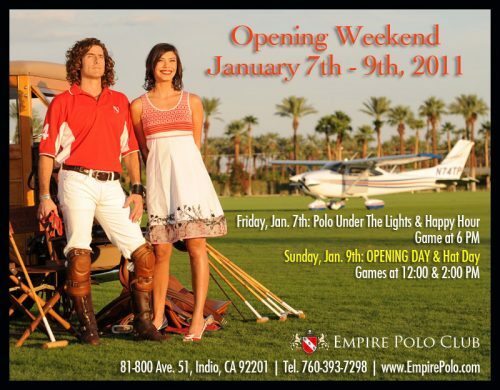 Indio, CA: Opening weekend kicks-off with Polo Under The Lights & Happy Hour on Friday, January 7th, 2011 at 6:00 PM. Two teams will compete under the lights in a competitive polo match on the main field at Empire Polo Club. General admission is free and everyone is welcome. Happy Hour beverage service will be available on site during Polo Under The Lights games. 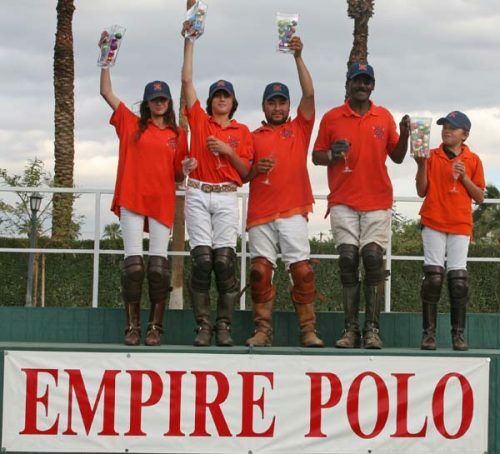 Opening Day of the 2011 polo season at Empire Polo Club is scheduled for Sunday, January 9th, 2011. After taking many years off from operating an active polo club, Empire Polo Club is now back in the polo saddle. They are celebrating the “Grand Re-Opening” of their polo club this winter and they would like the general public to help them make this inaugural season one to remember. 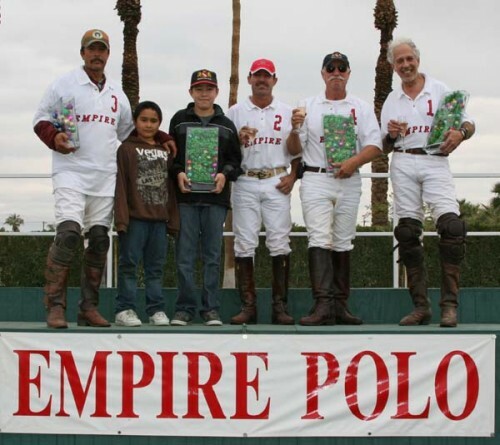 Sunday, January 9th 2011 is the “Official Opening Day” at Empire Polo Club. Put on your best Sunday hat and join us for a celebration of traditional polo, desert-style. While the dress code at polo is very casual, Empire Polo Club will host a hat contest on Opening Day. We will be judging the hats in two divisions: the most traditional and the most creative. Don’t be shy, put on the most outrageous hat you have and join in the fun. A halftime, champagne divot stomp is scheduled during the 2:00 pm game and is sponsored by Korbel California Champagne. What to wear? This is one of the most asked questions by spectators. We suggest “hats and flats” as heels sink in the grass and the sun is always shining here in the desert. Polo is a casual affair at Empire Polo Club, so please wear whatever you feel comfortable in. You will see spectators wearing everything from shorts, jeans and flip-flops to sun-dresses, khakis and button down shirts. For more information about “How To Dress For Polo” visit our website at www.empirepolo.com. Polo Every Sunday Jan. 9th – March 27th, 2011. During Sunday Polo the games are scheduled at 12:00 and 2:00 PM and are open to the public. General admission is free and includes seating in the field-side bleachers. Spectators are also welcome to bring their own chairs or a blanket for tailgating along the east side of the main field. Food and beverage service is available on site and restroom facilities. Private, field-side boxes are available for an additional fee. Boxes can be purchased for the season or by the day. Designated VIP areas are available for playing and social members. Seasonal Social memberships are available to the public for an additional fee. From I-10 take the Monroe St. exit and head south on Monroe St. Turn right on Avenue 50. The entrance for this particular weekend will be the Empire Polo Club middle gate on Avenue 50. What better way to spend your Sunday afternoon? Imagine sitting field-side, overlooking a series of immaculate polo fields surrounded by the majestic mountains in the distance while watching one of the fastest team sports on earth. You can take a date, your spouse, your family or a group of friends and enjoy a day outdoors while watching the polo ponies thunder along the fields below. 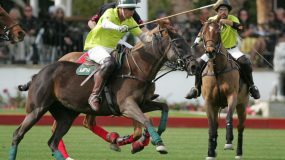 Polo is never boring when you have eight players traveling at speeds up to 30 miles-per- hour while riding-off other players, hooking their opponent’s mallets and hitting the ball at full speed. It is a great way to spend your day and general admission is FREE. You can’t beat that! Established in 1987, Empire Polo Club is one of the largest polo clubs on the west coast with 7 polo fields and an indoor arena and a polo school. Polo is played Wednesday through Sunday, November through March with featured matches beginning on Sunday, January 9th at 12:00 and 2:00. 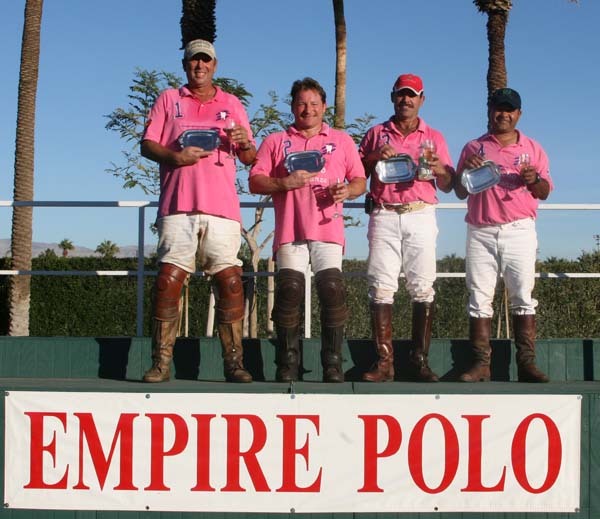 Empire Polo Club is a world-class, international polo club. Players from Canada, Mexico, Argentina, Maylaysia, The Philippines, South Africa, France, Germany, England and other countries flock to the desert to play polo at Empire Polo Club. Player’s ages range from the young up-and-comers, who are in their early teens to seniors in their 60s. Trinity/Storm Cats: Rick Paicius 2, Alex Haagen IV 2, Ashton Wolf 2, Craig Steinke. 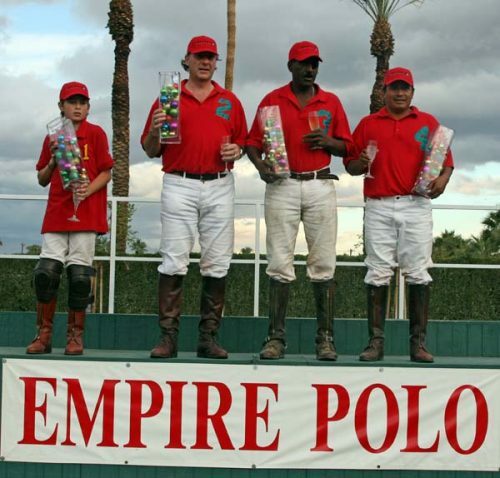 Empire Polo: Lolo Payan 3, Manny Rodriguez 1, Alex Haagen III 1, Canello Silvestre. Umpires: Kevin Ittig, Andy Maze; 3rd man: Malia McCoy. Empire Polo: Manny Rodriguez 6, Lolo Payan 6, Alex Haagen III 1, Rob Scapa, two on handicap. Trinity/Storm Cats: Ashton Wolf 6, Rick Paicius 2, Alex Haagen IV 3, Craig Steinke 1. Umpires: Andy Maze, Kevin Ittig; 3rd man: Kendra Clark. Manilla Polo Team: Carolyn Anier 2, Goyo Mariscal 2, Malia McCoy, Gina Padilla. Umpires: Cybelle Jordan, Andy Maze; 3rd man, Abby Riggs. Manilla Polo Team: Carolyn Anier 3, Malia McCoy 1, Gina Padilla, Goyo Mariscal. Umpires: Brad Ramsby, Andy Maze; 3rd man Connie Atkinson. Casa Lago: Domingo Questel 3, Alexandro Barojas 1, Sander Deutsch, Estee/Jonah Deutsch. Le Paon: Lolo Payan 3, Cybelle Jordan 1, Connie Keyfauver 1, Eddie Babai. Hollister: Brad Ramsby 1, Kendra Clark 1, Grainger Hines, Abby Riggs. CASA LAGO 5 , HOLLISTER 5 Casa Lago: Domingo Questel 3, Alexandro Barojas 2, Sander Deutsch, Estee/Jonah Deutsch. Hollister: Abby Riggs 3, Brad Ramsby 2, Kendra Clark, Grainger Hines. Umpires: Billy Ramos, Canello Silvestre; 3rd man, Goyo Mariscal. Casa Lago: Xander Deutsch 2, Domingo Questel 1, Estee/Jonah Deutsch, Alexandro Barojas, one on handicap. Le Paon: Lolo Payan 2, Connie Keyfauver, Cybelle Jordan, Eddie Babai. Hollister: Abby Riggs 3, Kendra Clark 2, Brad Ramsby 1, Grainger Hines. Le Paon: Eddie Babai 1, Cybelle Jordan 1, Lolo Payan 1, Connie Keyfauver. Casa Lago: Domingo Questal 3, Xander Deutsch 1, Estee/Jonah Deutsch, Alexandro Barojas. Hollister: Brad Ramsby 2, Kendra Clark 1, Abby Riggs, Grainger Hines. Umpires: Billy Ramos, Ashton Wolf; 3rd man, Vicky Owens. Casa Lago wins 1-goal tournament. Casa Lago: Domingo Questel 3, Alexandro Barojas 1, Sander Deutsch, Estee/Jonah Deutsch. 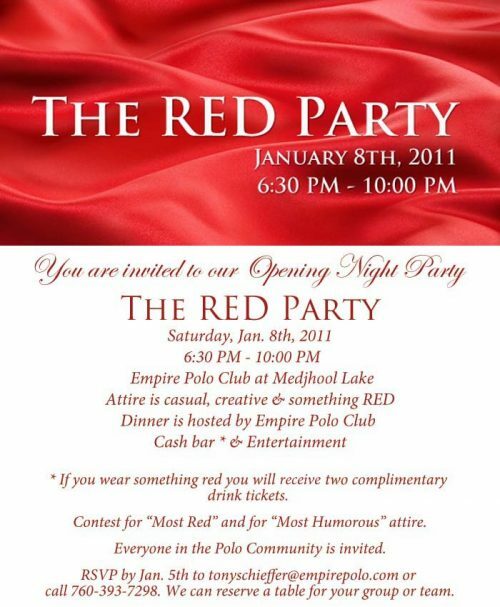 Join us for the RED Party on Opening Weekend, Jan. 8th, 2011. 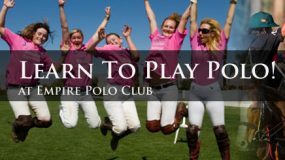 Social Members, Playing Members and polo players who play or work at other clubs are invited (Polo Community). Raiders win the Coyote Classic: Brad Rambsby, Shaun Flanagan, Lolo Payan and Goyo Mariscal. Raiders: Lolo Payan 4, Brad Rambsby 3, Goyo Mariscal 2, Shaun Flanagan. Los Lobos: Ashton Wolf 7, Dayelle Fargey 1, Eddie Babai, Kendra Clark. Umpires: Domingo Questel, Andy Maze; 3rd man Kate Ewart, Announcer: Kim Kelly. CHARGERS 10, RANCHO AMISTAD 6 Chargers: Domingo Questel 6, Ernesto Bautista 3, Hayward Pardue 1, Gustavo de Grieff. Rancho Amistad: Santos Areolla 4, Scott Walker 1, Karin McCoy 1, Kate Ewart. Umpires: Billy Ramos, Goyo Mariscal. Los Lobos: Ashton Wolf 3, Kendra Clark 2, Eddie Babai 1, Kim Garsed/Grainger Hines. Rancho Amistad: Santos Areolla 1, Kate Ewart 1, Scott Walker, Karin McCoy. Umpires: Brad Ramsby, Billy Ramos; 3rd man, Hayward Pardue. Raiders: Goyo Mariscal 3, Lolo Payan 2, Brad Ramsby 1, Shaun Flanagan Chargers: Domingo Questel 2, Ernesto Bautista 2, Hayward Pardue, Gustavo deGrieff, one on handicap. Umpires: Andy Maze, Santos Areolla; 3rd man, Kim Garsed.